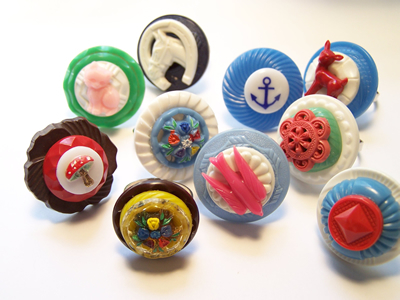 so learn how to make this yummy looking button rings with our own Amy Cluck over at her Peptogirl blog! Aren't they gorgeous!? Check out Amy's series of tutorials over on her blog. Great gift ideas for the holidays! Hi, it's Amy here, wishing you a happy Friday! In honor of "Freebie Friday" I want to point you to Jenna of CorgiPants who is offering up some very special dot-to-dot sewing cards for your downloading pleasure. It's a paper craft and sewing project in one that will be sure to take you back in time. Remember, back in the day, how you loved to connect the dots? Well, I sure do! Check out the CorgiPants blog for Jenna's free downloads and tutorial. We here at Pimp Stitch are wishing you all a happy and safe weekend! Happy stitching! When starting a new embroidery project, most of us reach for the good 'ol 100% cotton DMC in our floss box. But if you're looking to try something new, give some of these other fibers a go. The results might tickle your fancy! Silk floss is a beautiful, lustrous thread that is finer in diameter than most cotton threads. It's been used for many years for projects such as religious vestments and tapestries. Although it is more expensive than cotton floss, it usually comes in 5 meter lengths (about 5 1/3 yards). Because it's fine, you may made need to use more strands for certain stitches. Great for heirloom projects that need a special something-something. Linen thread is the newcomer to the stitching party. Due to the recent surge in crafting with linen, DMC has come up wtth a pretty palette of 24 colorfast colors made from 100% European linen fibers. Linen floss is springy and can be uneven in diameter. (Take note, perfectionist stitchers!) But the matte look and tonal qualities are de-lovely. Rayon Floss is super-shiny. A smidge more expensive than cotton floss, rayon is used for highly textured, 3-D projects such as Brazilian embroidery. No bikini wax involved. Check it out here. Amazing stuff involving a lot of crewel-like buillon stitches and knotting. This kind of floss has a reputation for being a little difficult to work with for traditional embroidery, such as cross-stitch, due to its tendency to curl, snarl and stretch. Overdyed Cotton Floss is the boutique-y floss on the market. Many of these are hand-dyed and variegated in color along the skein. Unfortunately, the colors may run a bit when washing. So be careful with caring for your projects. Some brands recommend a gentle pre-washing to remove excess dye. The up side is you'll find unique colors you won't see in your DMC bin at the craft store. It's very pliable, making for great punch-needle embroidery or for use on wool penny rugs. Love those. These are just a few additional types of fibers--I apologize if I've skipped over your favorite. Tell us about them! Enlighten us! And last night I just discovered the coolest one of all....glow in the dark. All together now: "Ooooooh. Ahhhhh..."
I know this book claims that it is for kids, but I couldn't help but fall in love with the bright colors and the fact that they employ embroidery on yummy fabrics like felt and fleece. The projects are super-simple and it'd be a great book for adults who are just learning to embroider. Even if you already know most of the stitches, tips, and tricks, it's still a great book for the inspiration and project ideas alone (the cross-stitched pillows and embroidered journal covers are adorable). And, of course, if you have a little one who's itchin' to try some stitchin' then this book is a MUST have. If you still aren't sure, you can download a sample project from the Melanie Falick Books blog (http://www.melaniefalickbooks.com/felt-needle-case-fro/) or view the gallery of projects (http://www.melaniefalickbooks.com/kids-embroidery-gallery/kids-embroidery-gallery/). This week Pimp Stitch is taking the week off from doing an embroidery tutorial, but we don't want to leave you hanging with no crafty inspiration to hold you over. Lauren made this awesome bracelet with supplies she pilfered from her daughter's jewelry box. It looks so easy and fun and the kids can help too. She made a great step by step tutorial on her blog complete with fantastic pictures. It's my job as a Pimp Stitcher to search the web and find a fabulous free pattern to share here on the blog every Friday! I have a whole archive already saved in my favorites, but I also like to do the normal google and yahoo searches too, just for fun. Today I thought I would do something different and search flickr for free patterns. I found a whole bunch of fabulous finished products that took me in all different directions, but I was most excited about this group! It's called Hoop Love. You have to join the group to be able to see the images, but it is a collection of vintage embroidery patterns posted by group members. It's a great place to see everything from vintage kittens and veggies to the very simple flowery embelishments of long ago! I hope you have a flickr account and will consider joining this group and maybe adding some scans from your own vintage pattern collection. I know I'll be adding some of mine later this week :) If you don't have a flickr account, read on... I'm sure you'll be convinced you need one by the end! "Flickr is an image and video hosting website, web services suite, and online community platform. It was one of the earliest Web 2.0 applications. In addition to being a popular Web site for users to share personal photographs, the service is widely used by bloggers as a photo repository. Its popularity has been fueled by its organization tools, which allow photos to be tagged and browsed by folksonomic means. As of November 2007[update], it claims to host more than 2 billion images." In addition to being a favorite image hosting site, it's also a great place for us, as bloggers and crafters (of ALL kinds) to connect like stitchers are doing in the Hoop Love group. Pimp Stitch also has a flickr group where our readers are invited to post and share their pictures of finished projects as well as share pictures related to the topics we post here. It's so exciting for us to see stitchers post pictures of their finished works, and projects! You don't even have to have a flickr account (which is free by the way) to view the pictures, so be sure to at least check it out even if you don't have something to add... (yet :). I know what you're thinking. She's seriously going to write a whole post on needles? A needle is a needle, right? Oh noooo. There's a whole world of needles--different shapes, sizes, materials and uses. And by the end of this diatribe, you might just pick up a few cool words to impress sewers and non-sewers alike. Like, "Last night, during The Office, I was laughing so hard I almost used a Calxy-eyed Sharp instead of a Glover on my sewing!" Ha ha. For most general sewing, Sharps are your friends. Not too long, small-eyed, they come in ten different diameter sizes. These are the ones you grab to sew a button on or whipstich a hem. Embroidery Needles, aka Crewel Needles are the same as Sharps, but with bigger, elongated eyes to accomodate multiple threads. Some Embroidery Needles are more blunt-tipped, like Tapestry or Cross Stitch needles that will slide through the open holes in the fabric easily without snagging. Betweens are shorter than Sharps and used for hand quilting or tailoring where you need maneuverability. Is that a real word? 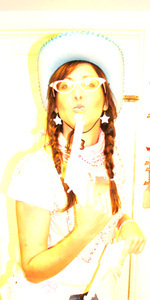 The opposite of those are Millinery Needles--they are longer. Calyx-eyed needles are self-threading and have a slot you push the thread down onto. Most needles are made from steel or are nickel or gold-plated. The finest needles are Platinum. Needle bling, who knew? Moving on.. It seems like almost every kind of material has it's own needle adapted just for it. Leather? Triangle-pointed Glover Needles that don't shred the leather as they sew. Chenille? Chenille Needles have very sharp points for tightly-woven fabrics. Canvas? Sailmaker Needles have a triangular point half-way up the shaft for the heaviest of fabrics. Doll Needles for doll faces, long Beading Needles that can hold a length of beads or sequins at a time...and I could go on. There's even cool, curved Upholstery Needles that can be used for everything from quilt-tying to fabric box-making. Or scaring small children a la Freddy Kreuger. So what's the point--get it, point? Sewing, like most crafts, can be very frustrating at times. It might be worth a little investing to have several kinds of needles in your stash for different projects. It makes your work faster, easier and more rewarding when you have the right tools handy. And be careful around those suckers..this woman looks dangerous!